Eating lunch while backpacking is a tricky thing. You don’t want to eat too much because it will slow you down. You don’t want to eat too little because you won’t have the calories you need to keep hiking. You don’t want anything too complicated that will take too long to prepare or be too messy. And you don’t want anything too heavy or large because every ounce and inch in your backpack counts. 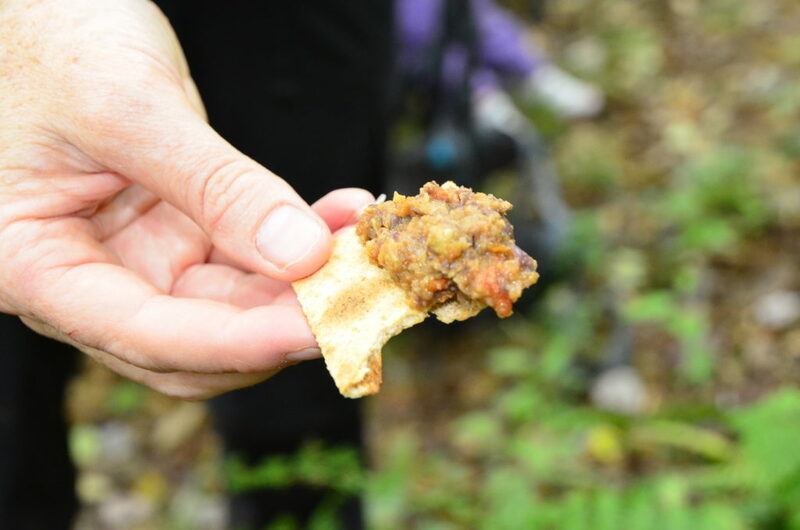 Our favorite lunch to eat on the trail so far has been crackers, cheese, and a meat. Generally a 6-8oz container of crackers, a 1/2 pound of cheese, and a large can of tuna/salmon or 1/2 pound of pepperoni/summer sausage works well for the 3 of us adults plus a toddler. If we are going on a day trip and space and weight aren’t an issue, we bring along a pesto of some sort. Spinach and kale pestos are great and lightweight ways to incorporate veggies into a trail diet. We also snack before and/or after lunch on bars of some sort – Probars and Uber Larabars are favorites. I have experimented with making and dehydrating bean dips and roasted veggie hummus with very good results. These dips are great with pita chips made by baking torn pieces of pita bread. Keeping the chips and crackers from being crushed in a backpack can be tough but you can get creative and make it work.